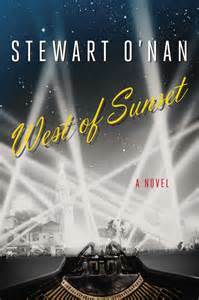 West of Sunset by Stewart O’Nan recounts the final years of F. Scott Fitzgerald’s personal and professional life in Hollywood. This novel reminded me of a movie entitled Beloved Infidel I dimly recollect from years ago starring Gregory Peck. I did however, find the story very interesting. As we all know, Fitzgerald was one of the great writers of our time. Countless movies have been made based on the books he wrote. During the Jazz Age, he and his wife Zelda lived the high life; rubbing elbows with many other famous artists and writers. Theirs is a tragic story. Fitzgerald was an alcoholic and Zelda suffered from mental illness. I thought this was a very sad story and found it even more sorrowful knowing it was true. Although much of the book is conjectured, it is based on truths which are widely known. The novel is populated with many famous Hollywood people who lived during that era. It also tells of Fitzgerald’s affair with a young female columnist, Sheila Graham, and his relationships with Zelda and their daughter, Scottie. It took me some time to really engage in this book, but once I did, I felt I learned a great deal more than I had previously known about Fitzgerald and the times in which he lived. I am uncertain if the italicized quotes were fictional or not, but either way, I appreciated the story as it increased my knowledge of a great writer. This entry was posted in Uncategorized and tagged ashville, Books, F Scott Fitzgerald, Hollywood, Jazz age, Sheila Graham, Stewart O'Nan, West of Sunset, writing. Bookmark the permalink. Fitzgerald has never appealed to me. Heresy I know, but there you are. Perhaps its because I’m not an American. Alison, thank you for your honesty. Fitzgerald is not my favorite either. I think much of his appeal comes from interest in the times in which he lived. I do however, prefer Hemingway!